This case is a nursing home fall wrongful death claim was filed in Anne Arundel County against a Genesis nursing home after a man suffered a head injury during a fall. It was filed in Health Claims Arbitration on March 27, 2018, and it is the 143rd medical malpractice case filed in Maryland this year. What is the value of a nursing home death case? A man was admitted to the Severna Park Center, a Genesis owned nursing home, following the amputation of his right leg. 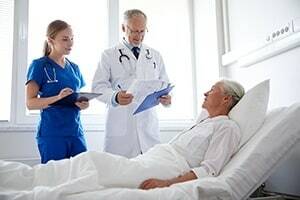 Due to the man's mobility issues, the nursing staff should have known that he was at high risk of falling and implemented an appropriate fall prevention care plan. The man was also on blood thinners, which could complicate a fall injury. Without the proper care plan in place, the man fell and hit his head. Even though he sustained a head injury while on blood thinners, the man was not immediately sent to the hospital. Five hours later, nursing home staff found the man to be unresponsive and transported him to the hospital via ambulance. When he arrived at the hospital, the man was diagnosed with a massive intracranial hemorrhage. He continued to deteriorate quickly and died before he could be transferred out of the emergency room. Plaintiff hires a lawyer and filed a lawsuit alleging that the nursing home failed to develop a fall care plan that was commensurate with the patient's high-risk level for a fall. Head injuries are always a serious medical concern, but the man's advanced age and history of taking blood thinners put him at even greater risk. Major injuries can cause a rapid decline in the overall health of a senior patient and can be fatal if not treated in a timely manner. Skilled nursing facilities are required to comply with federal regulations contained in 42 CFR 483, subpart B, as well as standards of professional care. Among other things, this regulation requires nursing homes to conduct a complete and accurate assessment of every resident's functional capacity. After reviewing the medical records, the claimant's expert witness in nursing concluded hat that the man should have been assessed and scored as a "high risk" of falling. The nursing staff at Severna Park Center, however, scored him as a "moderate risk." Plaintiff's lawyer alleges that the inaccuracy of this assessment was causally related to this man's death. Assuming the plaintiff can prove that there was a misclassification, there is going to be a causation argument on this contention. Plaintiff has to explain why the higher assessment would have prevented the man's death. Can the plaintiff make that argument? It is going to depend on the specific facts of the case. Intracranial hemorrhages fall into two categories. A parenchymal hemorrhage (hematoma) is a focal collection of blood within the brain tissue. A subarachnoid hemorrhage is bleeding into the fluid space around the brain. Failing to provide adequately trained staff capable of completing thorough fall risk assessments and developing appropriate care plans accordingly. Failing to recognize that the man was a high risk for falling and put the appropriate measures in place. Failing to perform an appropriate assessment of the man's injuries following his fall. Failing to transport the man to the hospital immediately after he suffered severe facial and head trauma. View sample medical malpractice verdicts and settlements from Anne Arundel County. Learn about Genesis nursing homes and the lawsuits filed against them. Read more about nursing home fall lawsuits.